7 AM to 8:30 AM. Every morning, during those 90 minutes, I get myself and my baby dressed, and then I get my 4-year-old Tsoofy and 2-year-old Yaakov ready for gan. It’s 90 minutes full of minor battles which, with the slightest misstep in strategy, could explode at a moment’s notice into a full-blow war. And this morning, unfortunately, there were even more battles brewing than usual. First Yaakov decided he was going to wear the shirt of his 8-year-old brother, Yoel. It did look a bit funny, his shirt almost longer than his shorts, but he’s only two. So I let him. Then Yaakov decided he was going to build a “Lag Ba’Omer bonfire” out of all the toys in the playroom. It wasn’t exactly what I wanted, but he agreed to refrain from setting it on fire. So I let him. I was smoothly navigating my way around the brewing battles until Yaakov decided that this morning he wanted to eat pretzels with milk for breakfast. So Yaakov stood by the fridge screaming for me to give him the milk from the high shelf. He stood there so long with the door open that the fridge starting its warning “Lady, wake up! The Fridge is Open Forever!” beep and I had no choice but to tape the fridge shut. 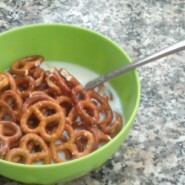 “We do not eat pretzels with milk!” I wasn’t budging, and neither was Yaakov. Until I realized—who cares if he eats pretzels with milk?! I am fighting over a matter of culinary etiquette which is of no importance to me whatsoever! And I told Yaakov that if he stopped crying (so that he would learn that tantrums never ever work, even though this one just had) I would give him pretzels with milk. And then he proceeded to eat the entire bowl, and even drank up the milk to the last sip. And I comforted myself with the thought that by losing some battles and avoiding some more, I can start my day as the victor of my daily 90-Minute War. I also like giving in with a good reason. I don’t mind giving in, because most of the time I say no without thinking….. whoops. Adult logic. So like you I also usually come up with a good “educational” reason why they could have it their way. And you know what? We are actually teaching them by example how to compromise at the same time!!! This is awesome! So many times we start the battle of the wills… But in the meantime we’re really not acting any different than the 2 year old. As always, you’ve encapsulated all of our lives and hit the nail on the head with your lessons!! Thanks for the inspiration, yet again. Both cereal and pretzels are wheat foods that are baked/fried. Just one seasoned with salt another with sugar. At least you realized that he needed to stop screaming to get what he is asking for otherwise we are reinforcing tantrum behavior. Luckily he ate it up, because if he didn’t that would have been reason for someone like me to get upset about wasting food…. I always enjoyed eating my potato chips along with (not in) a glass of milk. The milk balanced the saltiness so maybe that was why he liked it I wonder if this will be his breakfast of choice? Oh, the memories! When we lived in Eretz Yisroel… Of my three little boys making a big pile of toys and dancing around it singing Bar Yochai! (This went on until Succos). They are nearly grown now! Thanks, Chana Jenny, for the sweet memories!